Describe what feed tracking is. Enable and configure feed tracking for an object. 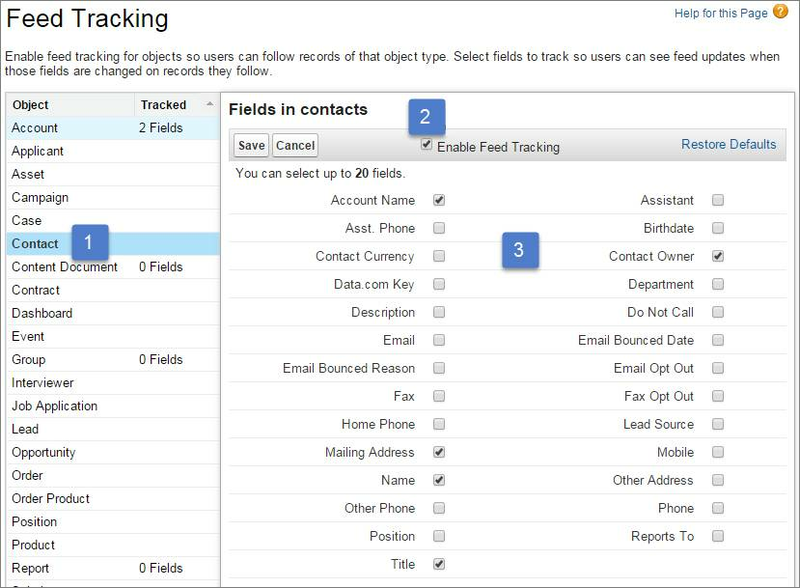 Feed tracking in Salesforce highlights changes to records by automatically announcing them in the record’s feed. 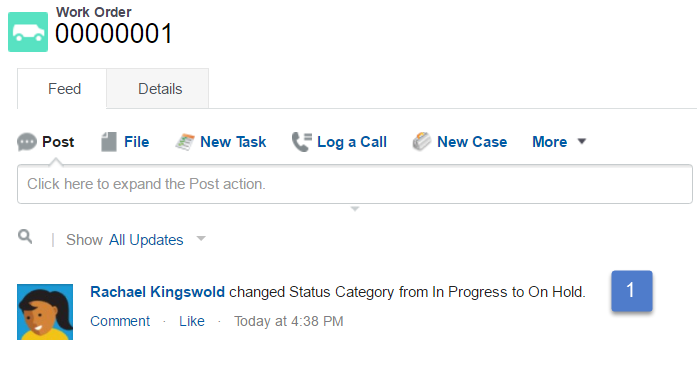 Here’s an example of a work order feed with a feed tracking post (1) announcing a change to the work order’s status. You decide which objects and fields you want to track with a simple point-and-click interface. Make your selections, and voila: changes to tracked fields appear in the record’s feed. One of the most powerful benefits of feed tracking is the visibility you get when you're on the go and using the Salesforce mobile app. Your mobile view of feed tracking makes it easy to see what's changing anytime, anywhere. You can track fields on the user, group, and topics objects, custom and external objects, and the following standard objects: account, article type, asset, campaign, case, contact, contract, dashboard, event, lead, opportunity, product, report, solution, task, and work order. Sharing rules and field-level security determine visibility of record changes in Chatter feeds. Users must have access permission to a record to see changes to that record in their feed. Many objects and fields are tracked by default, but you can further customize feed tracking to include or exclude specific objects and fields. Let’s enable feed tracking for the contact object and add some additional fields to track. From the list of objects, select Contact (1). Select Enable Feed Tracking (2). Select up to 20 fields (3). Click Save. After you save your changes, the number of tracked fields appears in the Tracked column next to Contact (1). When someone changes a tracked field, people who are following the object receive updates in their What I Follow feed. Even though you can track up to 20 fields per object, be selective and track only the fields that are important to your users. They get a post in their What I Follow feed whenever someone changes a tracked field on a record. Work with your teams to find out which record changes really matter to them and enable feed tracking for only those fields.